As I noted on Thursday, the Fed non-announcement gave the bulls a reason to charge back into the markets as “accommodative monetary policy” is once again extended through the end of the year. Of course, it is not surprising the Fed once again failed to take action as their expectations for economic growth were once again lowered. Simply, with an economy failing to gain traction there is little ability for the Fed to raise rates either now OR in December. However, it was the docile tones of the once again “Dovish” Fed that saved market bulls from a “bearish” rout. 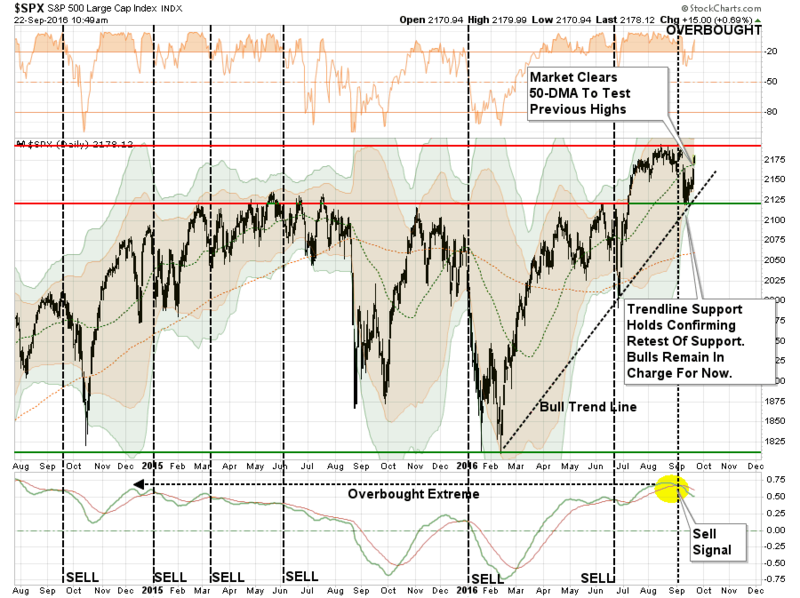 The recent test of the bullish trend line from February lows combined with a move back of the 50-dma clears the way for the markets to retest, and potentially breakout, to new highs. 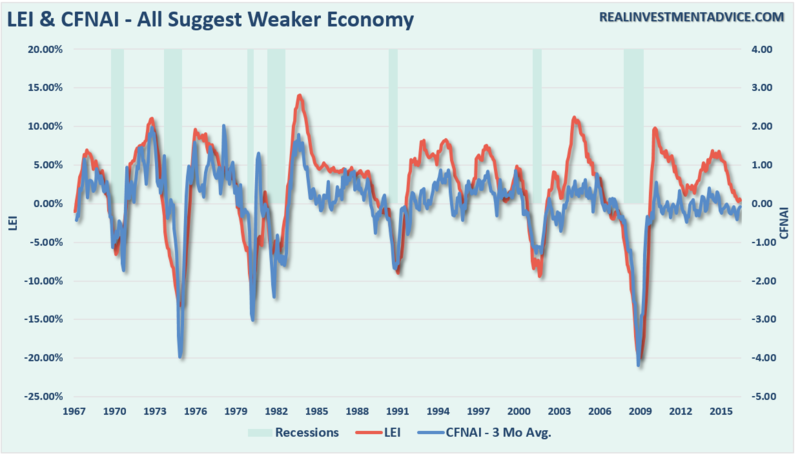 With economic data remaining extremely weak, and leading indicators continuing to roll over, the “bad news is good news as the Fed stays on hold” scenario continues to play to investor’s favor….for now. The question that remains, of course, is when does the reality of the weak economic environment begin to impact the fantasy of stock prices. It was interesting that Janet Yellen mentioned “commercial real estate values” in her latest comments to the press. To wit: “Yes. As I noted on Thursday, the Fed non-announcement gave the bulls a reason to charge back into the markets as “accommodative monetary policy” is once again extended through the end of the year. Of course, it is not surprising the Fed once again failed to take action as their expectations for economic growth were once again lowered. Simply, with an economy failing to gain traction there is little ability for the Fed to raise rates either now OR in December. 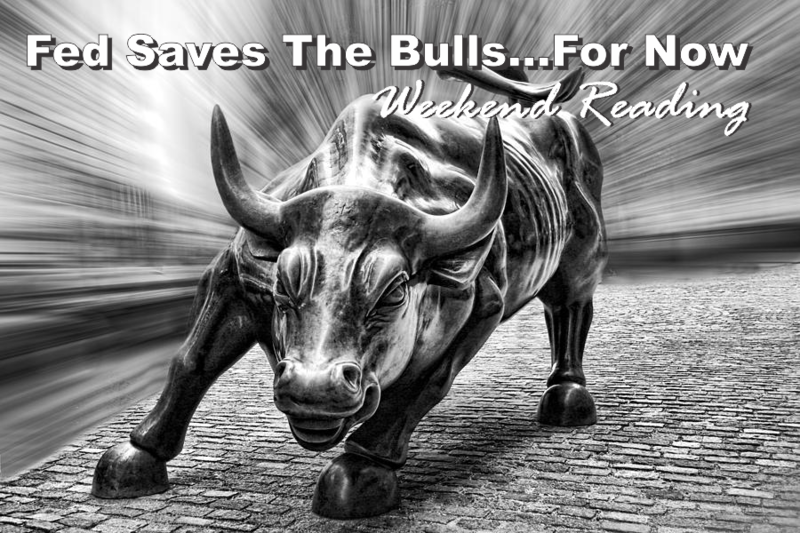 However, it was the docile tones of the once again “Dovish” Fed that saved market bulls from a “bearish” rout. The recent test of the bullish trend line from February lows combined with a move back of the 50-dma clears the way for the markets to retest, and potentially breakout, to new highs. With economic data remaining extremely weak, and leading indicators continuing to roll over, the “bad news is good news as the Fed stays on hold” scenario continues to play to investor’s favor….for now. The question that remains, of course, is when does the reality of the weak economic environment begin to impact the fantasy of stock prices. DO NOT misunderstand the gravity in her statement. Commercial Real Estate (CRE) valuations are a direct function of the economic cycle. The tenants of CRE buildings are companies that are affected by the ebb and flow of the economy. The reason that valuations are high relative to rent is due to the fact we are at a peak of an economic cycle. CRE values FALL during an economic recession as tenants give back space and vacate buildings. What Janet Yellen said, without saying it, is that stock market valuations are high as stock prices have been bid up by investors just as with CRE. When CRE valuations fall, so will asset prices along with valuations. However, for the moment, none of this matters. Global Central Banks continue to push assets into the market for now in the ongoing “chase for yield.” However, it is worth repeating that nothing last forever, but it can, and often does, last longer than you can imagine. Unfortunately, so does the reversion to the mean. But, in the meantime, here is what I am reading this weekend. 7 Lessons People Learn Too Late In Life by Nicolas Cole via Inc.
“Fed Says Economy Is Weaker And Stocks Go Up. If We Get A Depression I Will Be Rich!” — Richard Rosso, CFP.